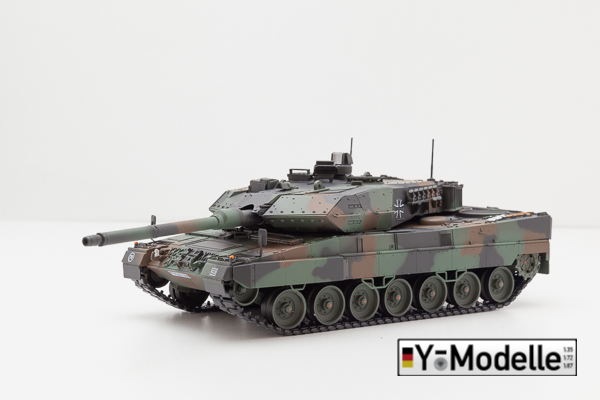 The Leopard 2A7 is the latest variant of Germany's premiere main battle tank. At the moment, twenty tanks are serving with Panzerbataillon 203 based in Augustdorf. 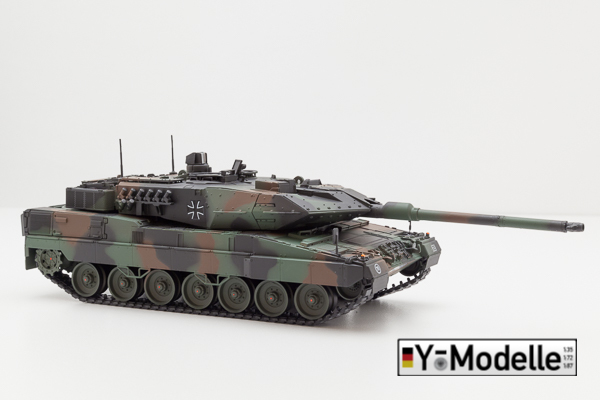 The Leoprad 2A7 has been based on the experiences made with the Leopard 2A7+ demonstrator. The twenty vehicles are a simplified variant of the demonstrator. 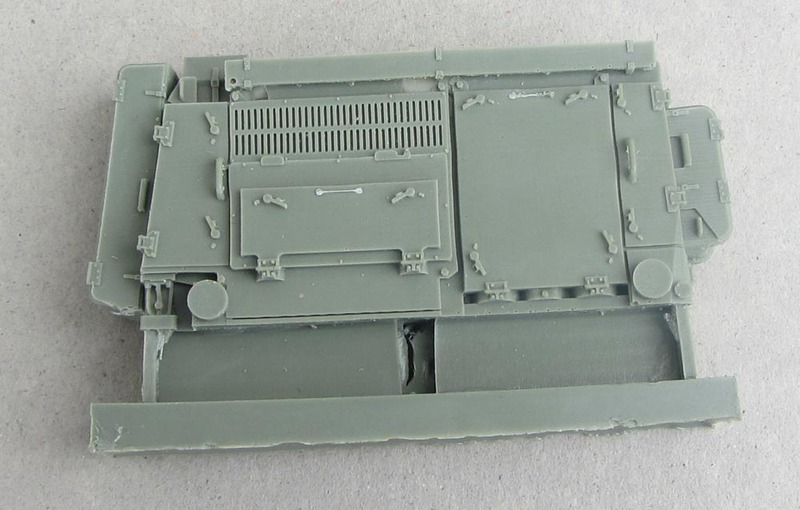 The main emphasis was placed on new systems for cooling the crew and electronics plus an APU and a new HE munition. These modifications were also as a result of experience gained in Afghanistan. 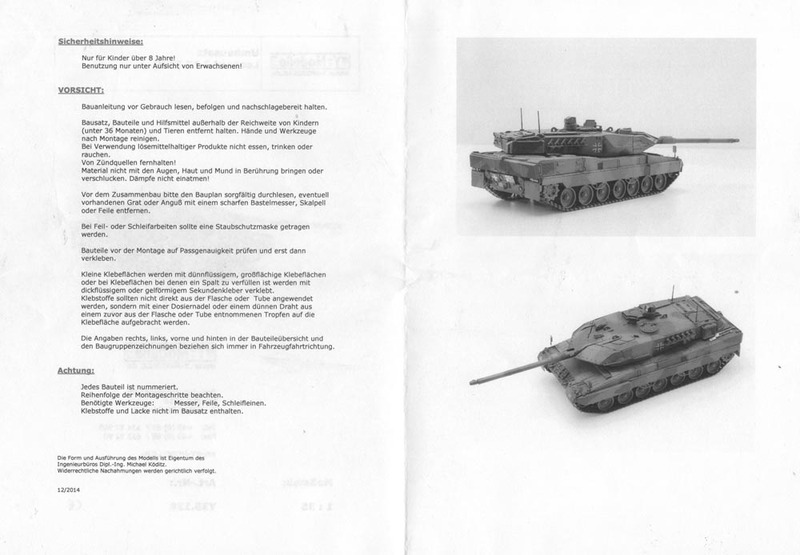 The twenty tanks were rebuilt from ex-Dutch vehicles with Candian funding - as compensation for the twenty Leopard 2A6 loaned to Canada for their ISAF operations. A new HE round, called DM11, has different modes of the fuze - impact, delay and airburst. Programming the fuze is done through an electric coil in the barrel. A new air-conditioning and energy management sytem is called EKKA (Energie- und Kampfraumkühlanlage). On the right rear corner of the hull is an APU which is a water-cooled 17 kW engine to power the tank's systems without the main engine running. The newly designed turret bustle holds the air-conditioning unit for the crew and turret-mounted electronics. A new C2 system, called IFIS (Integriertes Führungs- und Informationssystem - Integrated Command and Information System), is installed on the commander's station. The IFIS display can also be used above the hatch. Two mounting points are provided - one at 11 o'clock position and one on the commander's hatch - allowing the commander to use the display when the turret is in marching position, pointing at 6 o'clock. The IFIS system also uses new, longer Comrod antennas. 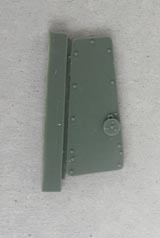 IFIS also contains a new intercom system with acuostic noise reduction and a Tank-Infantry telephone on the hull rear. On the hull sides, mounting points for additional armour are provided. The installation of the APU made it nessecary to re-stow some of the items on the engine deck. Therefore, the tow cables are now stowed on the engine deck around the coolers. 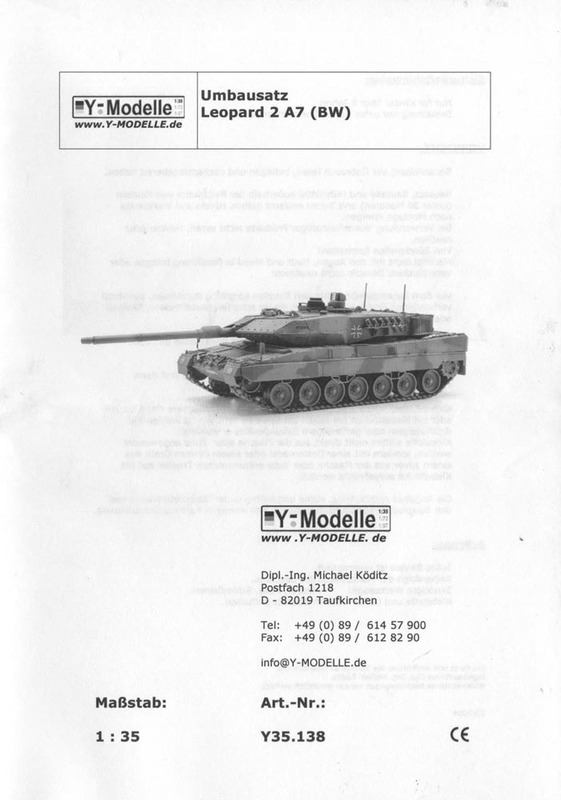 Y-Modelle is an aftermarket company from Germany, run by Dipl-Ing. Michael Köditz. 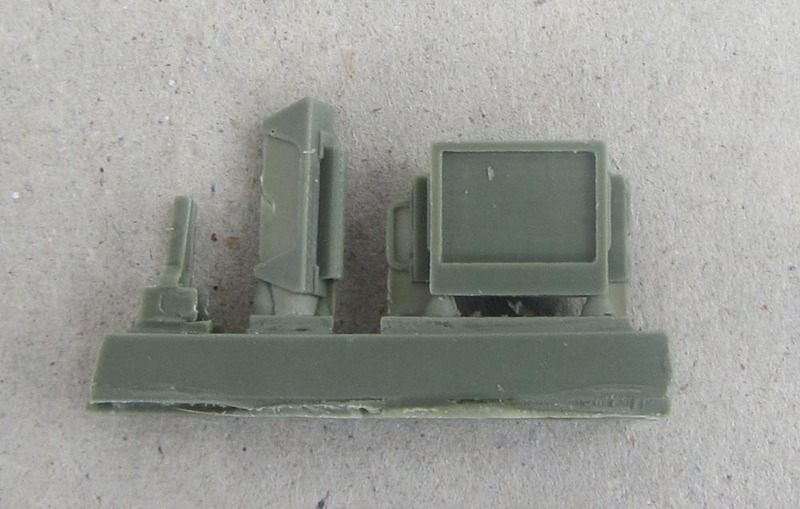 The company produces resin kits and conversions in 1.35 and 1.87 scale. Among the products are vehicles like the AMPV, Feldumschlaggerät and Dingo 2 Gefechtsschadeninstandsetzung. 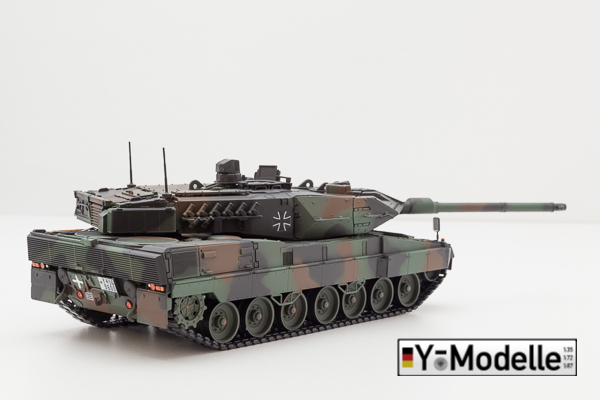 This kit depicts the Bundeswehr produciton configuration at the time of hand-over in 2014. The kit comes in a sturdy cardboard box. The parts are in ziplock bags but since there is no protective filling provided, there is a danger that some of the parts might get damaged. Two A4 size sheets are provided for the instructions. They are printed sheets with photos. 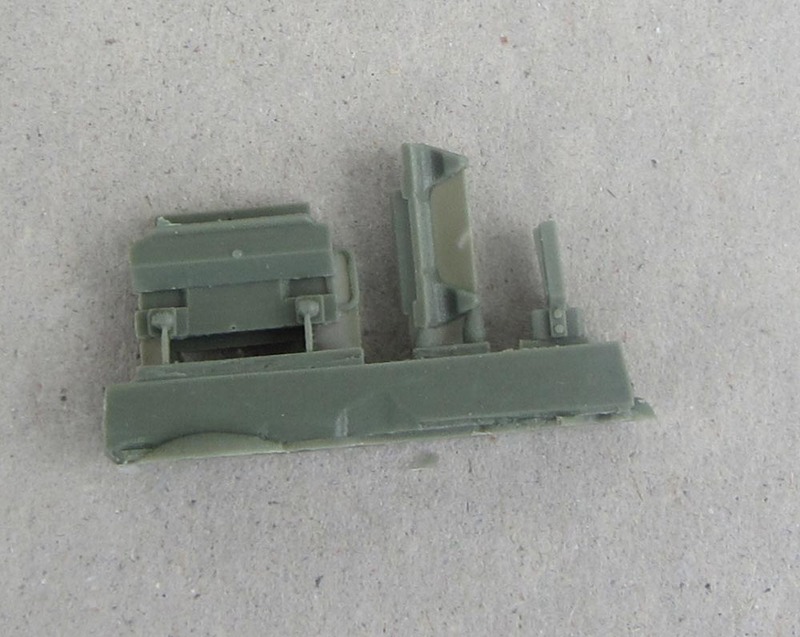 Unfortunatly, the pics are very small, about 3 cm by 5 cm, which makes it difficult to get the location of the parts right. A few words in German give some hints how the conversion has to be installed. It is a general problem with all Y-Modelle kits that the instructions are vague, at best. Before starting this review, a few words about references. 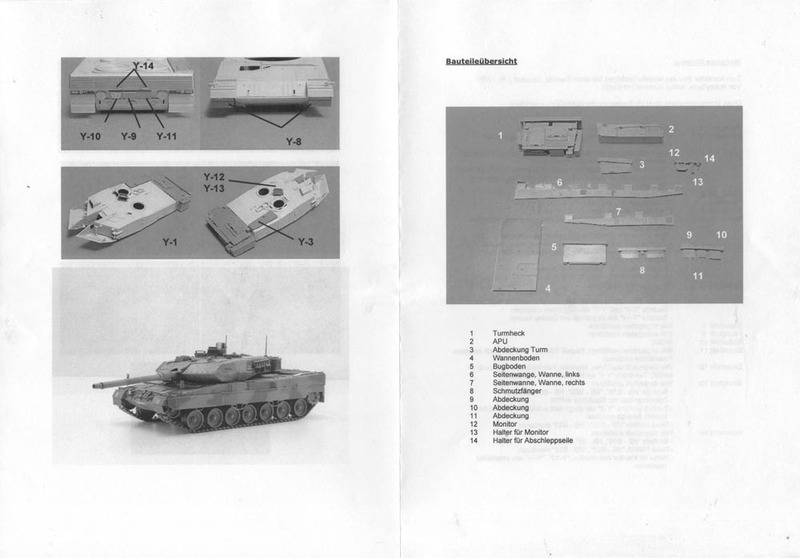 The only reference on the Leopard 2A7 is in Tankograd Militärfahrzeug issue 3/2014. While an overall good coverage of the vehicle is given, the report lacks some pics of the engine deck. 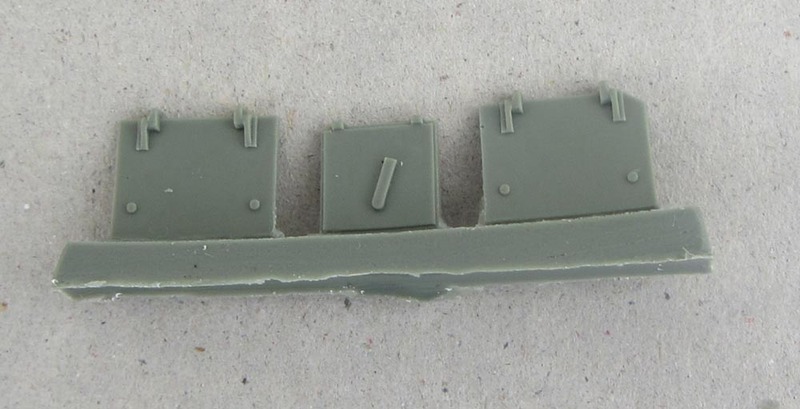 I have to admit that the greatest drawback of the conversion is that it has been designed for the HobbyBoss Leopard 2A6 model. 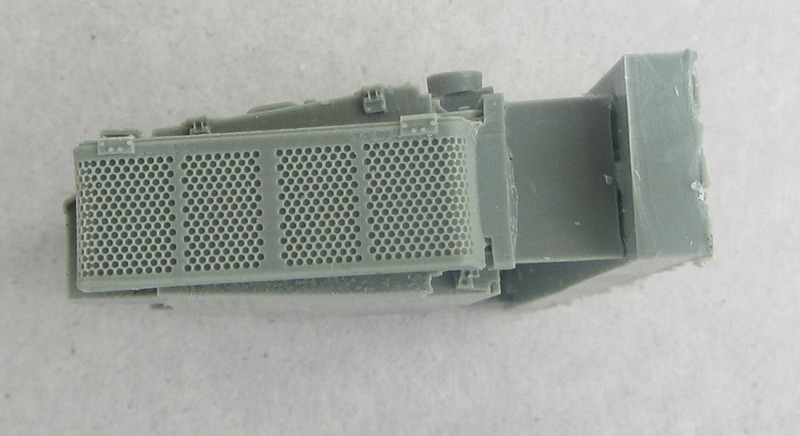 The HobbbyBoss kit is not the best Leopard 2A6 kit, but using the Y-Modelle conversion with other Leopoard 2A6 models will need some surgery. 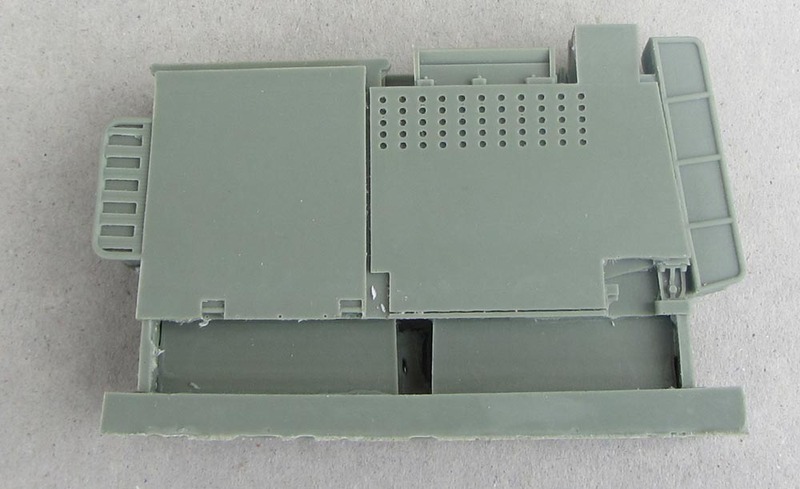 The kit contains 14 parts cast in grey-green resin. Casting of the parts is excellent with no air bubbles or damage. Only the large casting blocks are not welcome. The turret bustle/air-conditioning system is well reproduced. It looks like this part was made in 3D printing since you can see some characteristic parallel lines in the surface. The handles are cast in place with some thin skin inside. This means that the handles may break apart when you try to remove the skin. The mesh of the stowage baskets for camouflage netting is well reproduced. What is missing are the antenna bases for the Comrod antennas. Here the modeller has to build two of them from scratch. 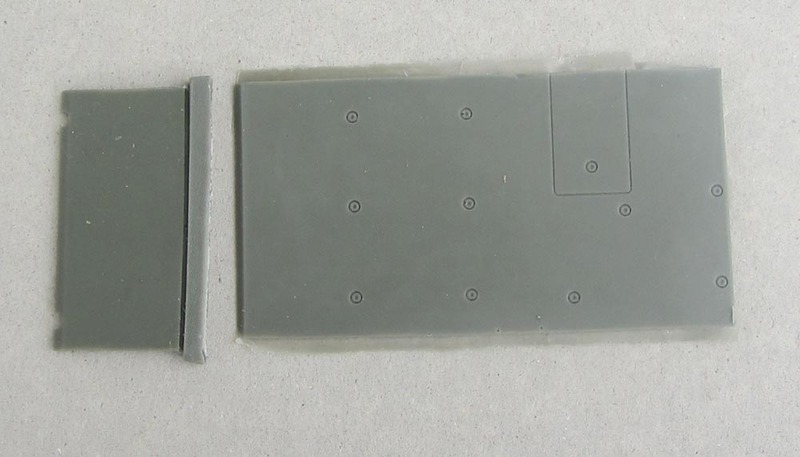 The modeller has also to cut out the hull where the APU needs to be installed. 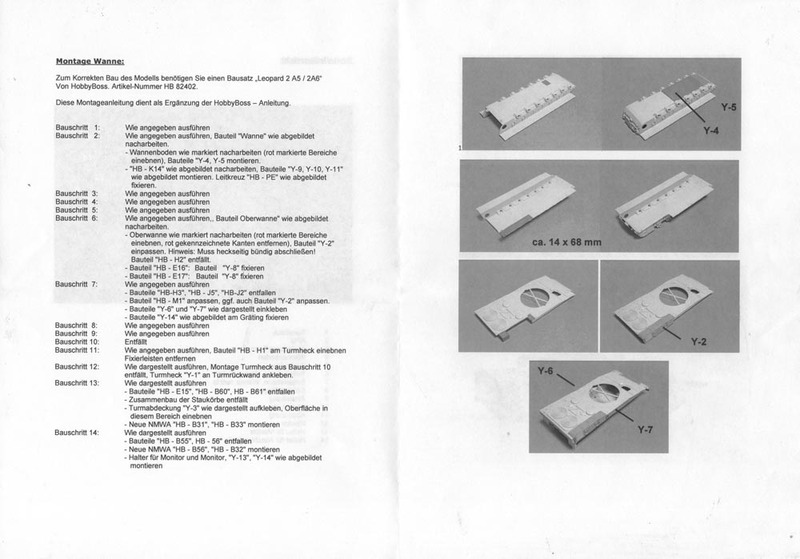 These portions are marked red on the instruction sheet. 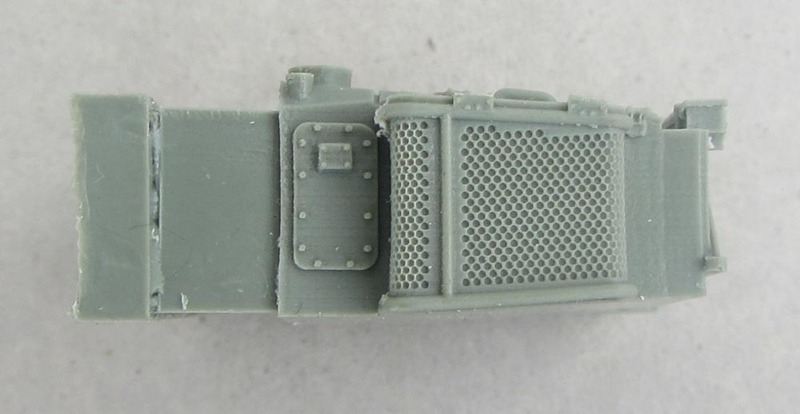 The installation of the IFIS monitor to the left of the commander's hatch is wrong, but judging from the pictures of the real tank, it would require PE part to get the mounting right. 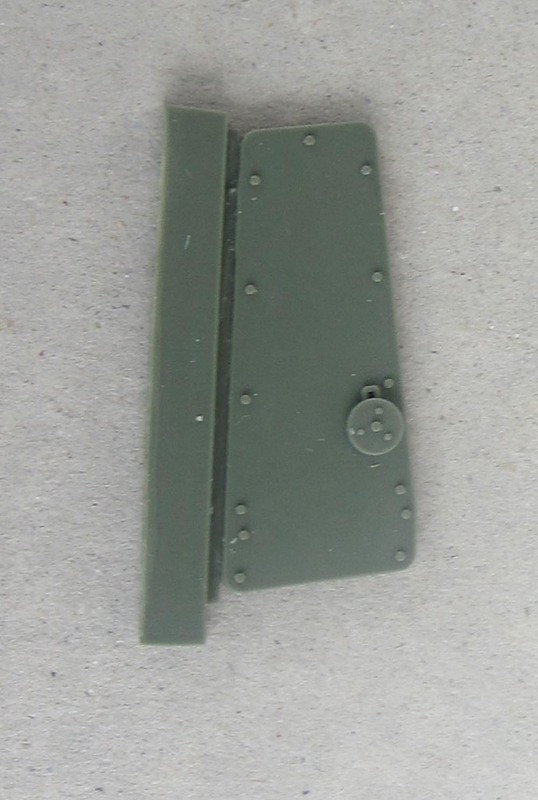 The IFIS mounting on the commander's hatch cover has been completely forgotten. To be honest, I am a little disappointed by this conversion. It was not what I expected for a price of 40 Euros. We can only hope that Y-Modelle has done better research with their other model kits.